Just as important as Languard’s physical layout is its population. Last week, I shared a first look at Languard’s map. This week, I’m diving into its population. Given the PCs will likely interact with many of Languard’s folk over their adventuring career (unless—of course—their delves go horribly wrong) it makes sense to get a good feel for the city’s folk. While I’m designing Languard (and Gloamhold) for use with Pathfinder, 5e and OSR rules my system of choice is Pathfinder. Thus, I’m primarily considering Languard’s demographics through this prism. Some mechanic-speak inevitably appears below. I’ll be using the slow advancement track for my own Gloamhold campaign (and as a base for my setting design). This will have the effect of “depressing” the levels of NPCs in the city as clearly they’ll abide by the same rules as the PCs. 90% are normal folk. In Pathfinder terms, these would be 1st-level commoners. I can’t really see any justification for a commoner above 1st-level, so the vast majority of these folk will always be 1st-level. 5% or 360 people are experts in their field. These could be masons, sages, weaponsmiths and so on. In Pathfinder terms, these folk have 1-3 levels of expert. 1st-level experts are the norm; 2nd-level experts are experienced while 3rd-level experts are skilled folk known throughout the city (and probably Ashlar). 4% or 288 people are men-at-arms, soldiers, members of the city watch and so on. I’ve always thought the warrior class to be a little bit pointless; it’s essentially a weak fighter. Thus, these folk will be non-optimised fighters. Most will be 1st-level. Veterans will be 2nd-level while champion types will be 3rd-level. The city watch is 80 strong and all will have at least one level of fighter. (Additionally, in times of crisis a militia of 400 can be called up, but these will mainly be commoners or experts). The duke also employs his own soldiers which probably accounts for the bulk of the remaining warriors. 1% or 72 people belong to the noble class. Of course, these folk are not all nobles—some might be particularly wealthy merchants, fabulously wealthy (retired) adventurers and so on. Some will have 1-3 levels of aristocrat. Others will have levels in expert or a “normal” adventuring class. 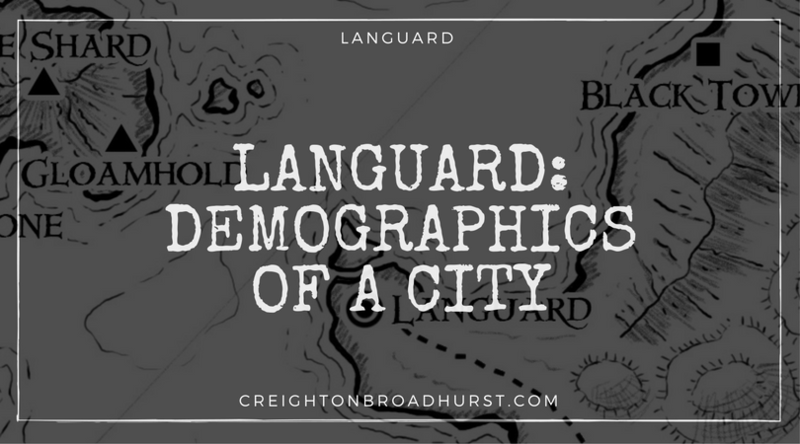 As the largest population centre in Ashlar and the closest settlement to Gloamhold, Languard will have a greater than normal proportion of adventurers within its walls. Fully 10% of the population (or roughly 800 people) have one or more levels in a normal adventuring class (fighter, cleric and so on). As a side note, I’m defining adventurers as someone who makes use of their class skills on a daily basis—clearly they are not all exploring Gloamhold (there would be traffic jams on the easier-accessible levels!) Rather these folk could be members of the thieves’ guild, mercenaries, folk passing through the city and so on. Spellcasters-for-hire also fall into this category. Spellcasting for Hire: NPCs who can cast spells on behalf of the PCs (and I’m thinking particularly of clerics and their various healing spells) will be rarer. This could be a “problem” for spells such as remove curse, remove disease and particularly raise dead. Magic Item Crafters for Hire: Fewer higher level spellcasters inevitably means fewer people available to craft magic items (beyond the basics such as potions and scrolls). Heroes of Renown: As the PCs gain levels they will become corresponding better known and more powerful and influential in the city. As you’ll see later, adventurers reaching the giddy height of 5th-level will be marked out as special folk capable of amazing feats. However, the numbers above are based on the 3.5 XP track, which is significantly faster to Pathfinder’s slow advancement track. For example, in 3.5 a 13th-level rogue has between 78,000 and 91,000 XP. Assuming he is halfway through the level, using the slow advancement track he would be 8th-level. Now this isn’t to say higher-level folk are not extant in the city—as the all-powerful designer I can place who I want where I want—but it gives me a good baseline to calibrate the relative levels of the various NPCs. For example, going back to the spellcaster-for-hire subject there are probably very few people capable of casting raise dead in the city; perhaps only the high priest of Conn has that power. (Although, it looks like reincarnate via Serat’s druidic followers is available—which practically forces me to create a bespoke reincarnate table!) Any half-way decent GM should take this into account when designing combat encounters. In Gloamhold, death is (probably) permanent. For more about level progression and the slow advancement track, check out this companion article. This level of pre-design work might not work for you, but I find it helps me imagine and conceptualise the various centres of power, factions and services in Languard. That—in turn—helps me create a flavourful city crammed full of cool—appropriate—features and folk for the PCs to encounter. For more Languard, check out the city’s main page! What do you think? Do you like this level of detail in your design or is it irrelevant? Let me know, in the comments below. Reputation, I’m sure all of us have lived at some time in a part of town that has a rough reputation, there may be a ‘red-light’ district or a ‘gated’ rich community, etc. People from this area could be introduced partly in the context of the area they are from. I find that one or two details give a flavour of an area and the pcs can do the rest. Yes–you are right. I should have made clear that the daily population will fluctuate as people flow into and out of the city. I’m particularly thinking of merchants and suchlike and how this would change with the seasons. I can imagine, “traffic’ grinding to a halt during the winter months as storms batter the bay and the roads turn to quagmires. Wonderful backdrop to the development of a town and great advice to predesigning NPCs. I especially like the overarching effects on the game with things like limited resources and death. When you have a limited number of higher level NPCs, how do you address their availability? If someone is renowned in the town/land, are they easily accessible? Do they have/hire underlings to navigate through? What is preventing them from using their power and superior level from creating fiefdoms or chaos other than their good nature (and I’m sure not all will be of good nature). This is something that has always bugged me about NPCs (particularly evil ones). If they are so much stronger than 90% of the town, what keeps them from lording over everyone? How does the 10% keep from becoming essentially minor local gods? This something I struggle with in my home game as well as designs. My players seem to think that any given service is immediately available when they want it (I call this the “Amazon” affect). Clearly a mechanic is required to determine whether the NPC is available or not. I’ll put my thinking cap on. Thank you for the suggestion. Thank you for writing so many great blogs! Our gaming philosophies are quite similar so your material is very useful to me. Also, I love the Duchy of Ashlar and the Lonely Coast both. I envision them across a straight or narrow sea from each other with the Ebon Realm connecting them underneath. Anyway, those are just random ideas. I truly enjoy your work and I’m really looking forward to Ashlar and Gloamhold. Thanks! Thank you for this comment, Chris. You struck on something I agonised over for a bit and then kind of pushed to the side. I was looking at the table on page 175 of the 1st edition DMG at one time to work out the relative rarity of various character classes, but it seems to have fallen off my radar. I’ll give some serious thought to taking another look at the numbers, though, as I like the fact that some classes are rarer than others. Although you are correct that minimum requirements have all but disappeared from 3.0 and beyond, some of the classes (paladin, monk etc.) so require multiple higher stats to be effective. Again, thank you for bringing this up.